The 59-year-old led the Boys in Green to the 2002 World Cup. MICK MCCARTHY IS in pole position to return for a second stint as Republic of Ireland manager, according to reports on Thursday afternoon. The news was first reported by Newstalk’s Off The Ball who said that negotiations between McCarthy and the Football Association of Ireland “could successfully conclude over the weekend”. RTÉ Sport echoed those words, adding that McCarthy, who managed the Boys in Green from 1996 to 2002, will arrive in Dublin this weekend to begin formal discussions on a contract. BREAKING: It’s believed negotiations between Mick McCarthy and the FAI over the vacant Republic of Ireland manager’s job could successfully conclude over the weekend. McCarthy is in line to assume the position for a second time. Before resigning after a poor start to the Euro 2004 qualifiers, 59-year-old McCarthy led Ireland to the last-16 of the World Cup, and since then has had spells in charge of Sunderland, Wolves and Ipswich. He is currently without a job since leaving the Tractor Boys in April. The FAI are looking to fill the position as soon as possible, vacant since yesterday as Martin O’Neill and Roy Keane parted company with the association “by mutual agreement”. 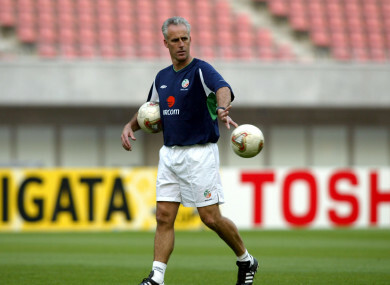 Email “Mick McCarthy set for second coming as Ireland manager - reports”. Feedback on “Mick McCarthy set for second coming as Ireland manager - reports”.